Not every pizza has to begin with a yeast dough - one you prepare or one you buy. Make your pies with a loaf of chewy, crusty bread and you have an easy and delicious dinner. 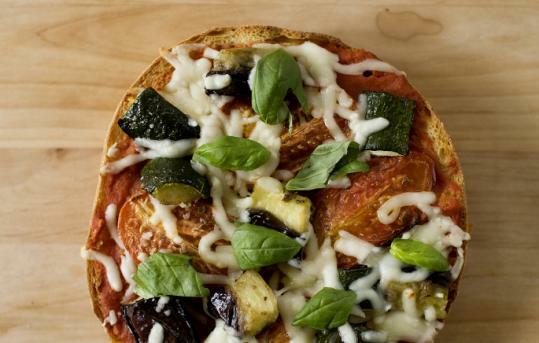 This savory pizza is assembled with a jar of marinara, roasted vegetables, and cheese. This recipe calls for tomatoes, squash, and eggplant, but add any favorites such as onions and bell peppers, cooked artichoke hearts or sauteed mushrooms. Select a variety of melting cheeses, including goat cheese for a tangy flavor. The vegetarian pie can accommodate meat lovers if you add cooked, sliced sausage, ham, or pepperoni. Set the hot-from-the-oven pizzas on a large wooden board and cut with a sharp bread knife. Toss that takeout menu and dig in. 1. Set the oven at 400 degrees. Have on hand 2 rimmed baking sheets. 2. Place the tomatoes on 1 baking sheet, the eggplant and zucchini on the other. Sprinkle the vegetables with olive oil, salt, pepper, and oregano or thyme. Mix gently. 3. Roast for 45 to 60 minutes or until vegetables are soft and slightly wrinkled. 4. Halve the bread horizontally. On a rimmed baking sheet, place bread cut sides up. Toast in the oven for 5 to 10 minutes or until crumb is slightly firm. 5. Spread both pieces of bread with marinara sauce. Top each with tomatoes, eggplant, zucchini, and cheese.